People say stupid things every day. You see it on social media. You see it from politicians. You see it from your friends and relatives. I’ve done it so often I had to develop a rule for myself to keep from saying something I will regret. As you strive to develop and deepen relationships, you cannot afford to say something stupid, offensive or even insensitive to a client, evangelist or prospective client. 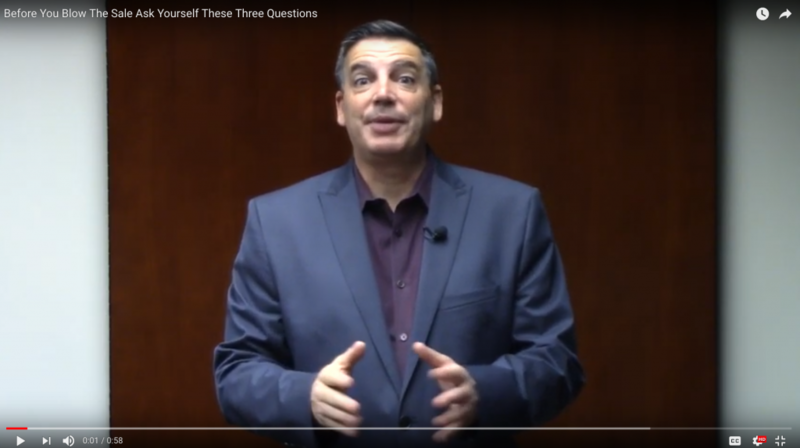 Here’s a video that highlights my three questions to ask yourself before you say something (it’s less than one minute long and definitely worth your time). I know it is popular to rail against “politically correct” speech. This is not that. This is preventing you from being stupid, rude and foolish. We live in America and you have the right to express your opinion but your clients also have the right to take their wallets and keep them closed if you offend them. Don’t just think before you speak. Ask yourself these three questions and if the answer to any of them is “NO” don’t speak at all. Five Ideas to Help You Sell More: These five ideas will jump start your sales. How To Promote Yourself Without Looking Like a Jerk: You’ve got to promote yourself. People will not know who you are unless you tell them. You don’t have to look like a jerk while you get the word out about who you are. Relationship Development Checklist: This is one of the most valuable things I have ever posted on my website. It is my relationship development checklist. Use it every day to grow your business.